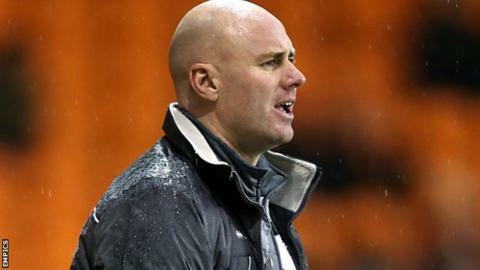 Port Vale manager Rob Page says there is no truth in reports linking him to the head coach's job with Championship side Cardiff City, his boyhood heroes. Cardiff are looking for a new boss following the decision to move Russell Slade upstairs as head of football. But Page admitted to knowing nothing about any speculation following Sunday's 5-0 home defeat by Walsall. "I want to be successful in football," he said. "I'll go wherever it takes me, but I don't need to get back to Wales." Rhondda Valley-born former Wales international Page played nine games for the Bluebirds after joining them from Sheffield United in July 2004 before leaving just seven months later to sign for Coventry City. "I have a lot of family and friends back there," he told BBC Radio Stoke. "And of course it is nice to go back and see them. "It's my club Cardiff City, so people will put two and two together. But there is nothing in it," added Page, who is halfway through his current two-year contract at Vale Park. Page says that the immediate task is further contract talks with his players as he tries to pick them up following the up-for-sale club's worst defeat in over two years. "I am fully focused now on trying to pick the players up and rebuilding," Page said. "They are all hurting and rightly so. It is about picking them up and sending them off on their holidays. "They need a break now. They need to get away from it and come back raring to go, with a few additions on 1 July. "We have a lot of work to do. Within the next seven days, it is about nailing things down and knowing what we have to work with."